A great effect of spending a day in the same room with 20 or so more geeking inclined others, is you get a lot of examples, tools and services mentioned. And geek is as geek does, I try them out on the spot. Today this helped me become aware that something is wrong on my server with the OAuth authentication I run. I thought that it was working fine, as it is no problem to actually use it, for instance to log in with my own domain name at the IndieWeb wiki. But when interacting with my micropublishing endpoint not all goes well. Those missing syndication targets (now that I understand what they are from todays sessions) was what first caught my eye. Testing the micropublish endpoint on my server myself I got the correct response, but Quill turned out to get ‘unauthorized’ as response for that request, just like micropublish.net got for posting. In WordPress my IndieAuth plugin has a diagnostic tool, and running that, it turns out an authorisation header is not send out. 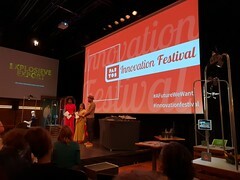 During his keynote at the Partos Innovation Festival Kenyan designer Mark Kamau mentioned that “45% of Kenya’s GDP was mobile.” That is an impressive statistic, so I wondered if I could verify it. With some public and open data, it was easy to follow up. World Bank data pegs Kenya’s GDP in 2016 at some 72 billion USD. Kenya’s central bank publishes monthly figures on the volume of transactions through mobile, and for September 2018 it reports 327 billion KSh, while the lowest monthly figure is February at 300 billion. With 100 Ksh being equivalent to 1 USD, this means the monthly transaction volume exceeds 3 billion USD every month. For a year this means 3*12=36 billion USD, or about half of the 2016 GDP figure. An amazing volume. 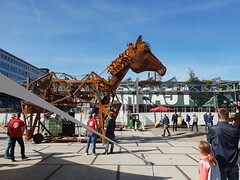 Saturday I visited the Maker Faire in Eindhoven. 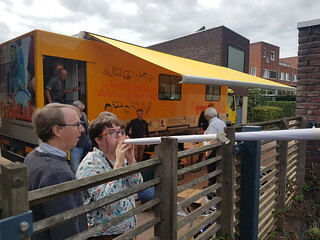 Jeroen of the Frysklab team invited me to come along, when their mobile FabLab was parked in our courtyard for Smart Stuff That Matters. They had arranged a touring car to take a group of librarians and educators to the Maker Faire, and invited me to join the bus ride. So I took a train to Apeldoorn and then a taxi out to a truck stop where the bus was scheduled to stop for a coffee break, and then joined them for the rest of the drive down south. The Maker Faire was filled with all kinds of makers showing their projects, and there was a track with 30 minute slots for various talks. It was fun to walk around, meet up with lots of people I know. 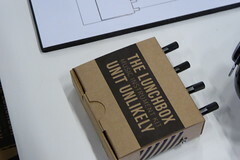 Lots of projects shown seemed to lack a purpose beyond the initial fascination of technological possibilities however. 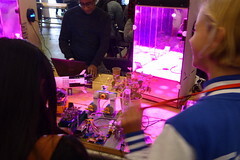 There were many education oriented projects as well, and many kids happily trying their hand on them. From a networked agency point of view there were not that many projects that aimed for collective capabilities. 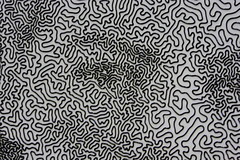 Some images, and a line or two of comment. 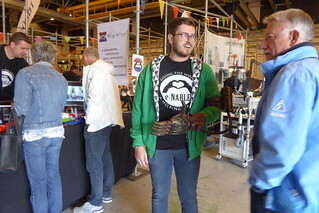 En-able, a network of volunteers printing 3d-printed prosthetics, was present. Talked to the volunteer in the image, with his steam-punk prosthetic device. 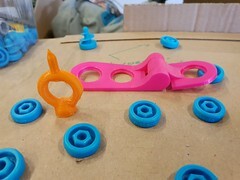 They printed 18 hands and arm prosthetics for kids in the Netherlands last year, and 10 this year until now. Children need new prosthetics every 3 to 6 months, and 3d printing them saves a lot of costs and time. You even get to customise them with colors, and your favourite cartoon figure or super hero. 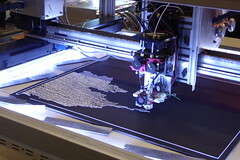 3d printing with concrete, a project in which our local FabLab Amersfoort is involved. Didn’t get to see the printer working alas. 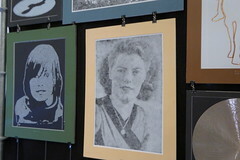 Novelty 3d printing of portraits. 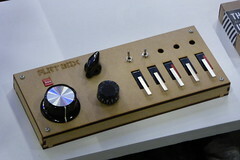 Building your own electronic music devices. 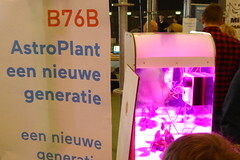 Bringing LED-farming to your home, open source. Astroplant is an educational citizen science project, supported by ESA. 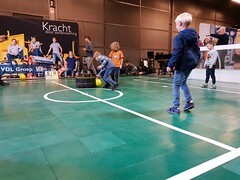 Robot football team versus kids team. 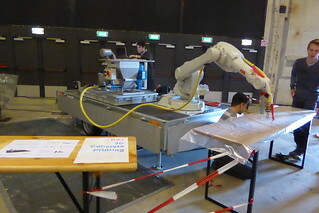 Quite a few educational projects around robotics were shown. Mostly from a university of applied sciences, but with efforts now branching out to preceding education levels. Chatted to Ronald Scheer who’s deeply involved in this (and who participated in our Smart Stuff That Matters unconference). 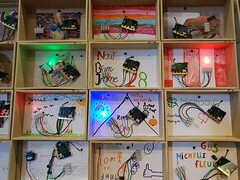 A good way to showcase a wide range of Microbit projects by school children. I can see this mounted on a class room wall. An open source 3d-printed, arduino controlled android. But what is it for? Open source robotics in general is of interest of course. 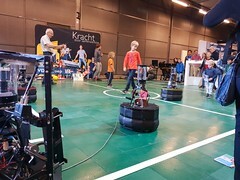 There were also remote controlled robots, which were quite a lot of fun, as the video shows. 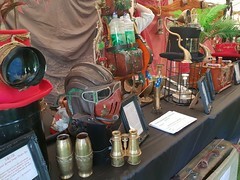 At the fringe of the event there was some steam punk going on. 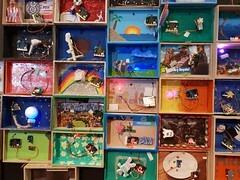 Building with card board boxes for children. 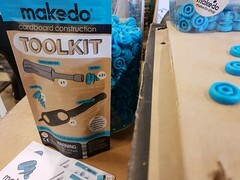 Makedo is an Australian brand, and next to their kits, you can find additional tools and elements as 3d printable designs online. 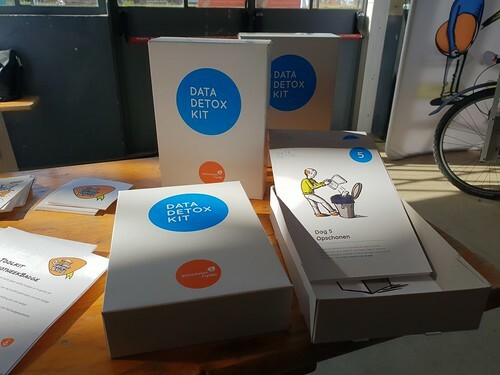 The Frysklab team presented the new Dutch language Data Detox kit, which they translated from the English version the Berlin based Tactical Tech Collective created. This week I am in Novi Sad for the plenary of the Assembly of European Regions. Novi Sad is the capitol of the Vojvodina, a member region, and the host for the plenary meetings of the AER. I took part in a panel to discuss the opportunities of open data at regional level. The other panelists were my Serbian UNDP colleague Slobodan Markovic, Brigitte Lutz of the Vienna open data portal (whom I hadn’t met in years), Margreet Nieuwenhuis of the European open data portal, and Geert-Jan Waasdorp who uses open data about the European labour market commercially. Open data is a key building block for any policy plan. The Serbian government certainly treats it as such, judging by the PM’s message we just heard, and the same should be true for regional governments. Open data from an organisational stand point is only sustainable if it is directly connected to primary policy processes, and not just an additional step or effort after the ‘real’ work has been done. It’s only sustainable if it means something for your own work as regional administration. We know that open data allows people and organisations to take new actions. These by themselves or in aggregate have impact on policy domains. E.g. parents choosing schools for their children or finding housing, multimodal route planning, etc. So if you know this effect exists, you can use it on purpose. Publish data to enable external stakeholders. You need to ask yourself: around which policy issues do you want to enable more activity? Which stakeholders do you want to enable or nudge? Which data will be helpful for that, if put into the hands of those stakeholders? This makes open data a policy instrument. Next to funding and regulation, publishing open data for others to use is a way to influence stakeholder behaviour. By enabling them and partnering with them. Positioning open data this way, as a policy instrument, requires building connections between your policy issues, external stakeholders and their issues, and the data relevant in that context. This requires going outside and listen to stakeholders and understand the issues they want to solve, the things they care about. You need to avoid making any assumptions. 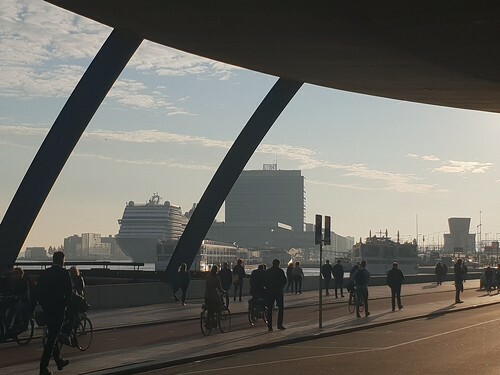 We worked with various regional governments in the Netherlands, including the two Dutch AER members Flevoland and Gelderland. With them we learned that having those outside conversations is maybe the hardest part. To create conversations between a policy domain expert, an internal data expert, and the external stakeholders. There’s often a certain apprehension to reach out like that and have an open ended conversation on equal footing. From those conversations you learn different things. That your counterparts are also professionals interested in achieving results and using the available data responsibly. That the ways in which others have shaped their routines and processes are usually invisible to you, and may be surprising to you. In Flevoland there’s a program for large scale maintenance on bridges and water locks in the coming 4 years. One of the provincial aims was to reduce hindrance. But an open question was what constitutes hindrance to different stakeholders. Only by talking to e.g. farmers it became clear that the maintenance plans themselves were less relevant than changes in those plans: a farmer rents equipment a week before some work needs to be done on the fields. If within that week a bridge unexpectedly becomes blocked, it means he can’t reach his fields with the rented equipment and damage is done. Also relevant is exploring which channels are useful to stakeholders for data dissemination. Finding channels that are used already by stakeholders or channels that connect to those is key. You can’t assume people will use whatever special channel you may think of building. Whether it is about bridge maintenance, archeology, nitrate deposition, better usage of Interreg subsidies, or flash flooding after rain fall, talking about open data in terms of innovation and job creation is hollow and meaningless if it is not connected to one of those real issues. Only real issues motivate action. Complex issues rarely have simple solutions. That is true for mobility, energy transition, demographic pressure on public services, emission reduction, and everything else regional governments are dealing with. None of this can be fixed by an administration on its own. So you benefit from enabling others to do their part. This includes local governments as stakeholder group. Your own public sector data is one of the easiest available enables in your arsenal. 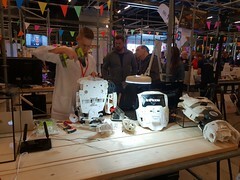 Last week the 2nd annual Techfestival took place in Copenhagen. As part of this there was a 48 hour think tank of 150 people (the ‘Copenhagen 150‘), looking to build the Copenhagen Catalogue, as a follow-up of last year’s Copenhagen Letter of which I am a signee. 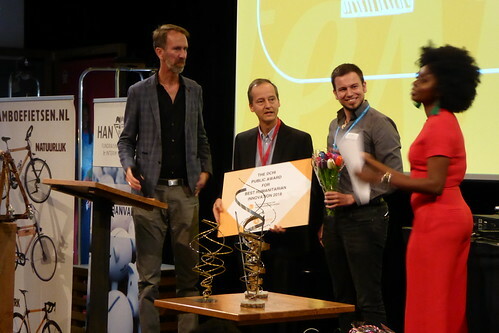 Thomas, initiator of the Techfestival had invited me to join the CPH150 but I had to decline the invitation, because of previous commitments I could not reschedule. I’d have loved to contribute however, as the event’s and even more the think tank’s concerns are right at the heart of my own. My concept of networked agency and the way I think about how we should shape technology to empower people in different ways runs in parallel to how Thomas described the purpose of the CPH150 48 hour think tank at its start last week. For me the unit of agency is the individual and a group of meaningful relationships in a specific context, a networked agency. The power to act towards meaningful results and change lies in that group, not in the individual. The technology and methods that such a group deploys need to be chosen deliberately. And those tools need to be fully within scope of the group itself. To control, alter, extend, tinker, maintain, share etc. Such tools therefore need very low adoption thresholds. Tools also need to be useful on their own, but great when federated with other instances of those tools. So that knowledge and information, learning and experimentation can flow freely, yet still can take place locally in the (temporary) absence of such wider (global) connections. Our current internet silos such as Facebook and Twitter clearly do not match this description. But most other technologies aren’t shaped along those lines either. As Heinz remarked earlier musing about our unconference, effective practices cannot be separated from the relationships in which you live. I added that the tools (both technology and methods) likewise cannot be meaningfully separated from the practices. Just like in the relationships you cannot fully separate between the hyperlocal, the local, regional and global, due to the many interdependencies and complexity involved: what you do has wider impact, what others do and global issues express themselves in your local context too. So the CPH150 think tank effort to create a list of principles that takes a human and her relationships as the starting point to think about how to design tools, how to create structures, institutions, networks fits right with that. Our friend Lee Bryant has a good description of how he perceived the CPH150 think tank, and what he shared there. Read the whole thing. Meanwhile the results are up: 150 principles called the Copenhagen Catalogue, beautifully presented. You can become signatory to those principles you deem most valuable to stick to. 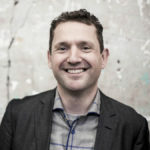 Heinz Wittenbrink, who teaches content strategy at the FH Joanneum in Graz, reflected extensively on his participation in our recent Smart Stuff That Matters unconference. We go back since 2006 (although I think we read each others blog before), when we first met at a BarCamp in Vienna. Later Heinz kindly invited me to Graz at several occasions such as the 2008 Politcamp (a barcamp on web 2.0 and political communication), and the 2012 annual conference of the Austrian association for trainers in basic education for adults. He writes in German, and his blogpost contains a lot to unpack (also as it weaves the history of our interaction into his observations), so I thought I’d highlight and translate some quotes here. This as I find it rather compelling to read how someone, who’s been involved in and thinking about online interaction for a long time, views the event we did in the context of his and my work. And that some of what I’m trying to convey as fundamental to thinking about tools and interaction is actually coming across to others. Even if I feel that I’ve not yet hit on the most compelling way to formulate my ideas. Heinz starts with saying he sees my approach as a very practice oriented one. 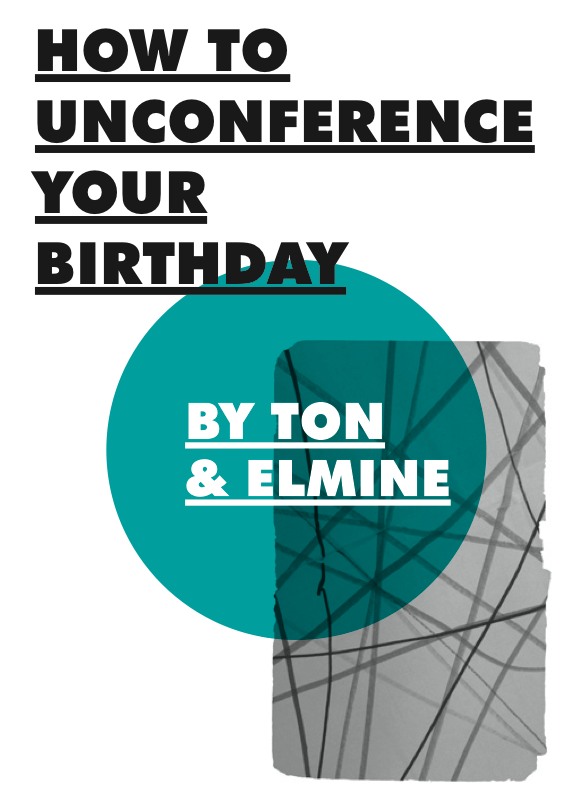 And then places the birthday unconferences we did in that context, as an extension of that practice oriented approach. Something I realise I didn’t fully do myself. Speaking about the unconference he says something that really jumps out at me. To list the themes [….of the sessions I attended…] fails to express what was special about the unconference: that you meet people or meet them again, for whom these themes are personal themes, so that they are actually talking about their lives when they talk about them. At an unconference like this one does not try to create results that can be broadcast in abstracted formulations, but through learning about different practices and discussing them, extend your own living practice and view it from new perspectives. These practices or ways of living cannot be separated from the relationships in which and with which you live, and the relationships you create or change at such an event like this. Seeing it worded like that, that the topics we discussed, theorised about, experimented around, are very much personal topics, and in the context of personal relationships, hits me as very true. I hadn’t worded it in quite that way myself yet. This is however exactly why to me digital networks and human networks are so similar and overlapping, and why I see your immediate context of an issue, you and your meaningful relationships as the key unit of agency. That’s why you can’t separate how you act from your relationships. And why the layeredness of household, neighbourhood, city, earth is interwoven by default, just often not taken into account, especially not in the design phase of technology and projects. Heinz then talks about blogging, and our earlier silent assumptions that novel technology would as per default create the right results. Frank’s phrasing and Heinz’s mention of the ‘original inspiration’ to blog resonate with me. It’s probably not a coincidence that the people I had the most intensive conversations with have been blogging for a long time. They all stuck with the original inspiration to blog. Frank in his presentation called it “to publish your own unedited voice”. The openness but also the individuality expressed in this formulation was clearly visible in the entire unconference. For me blogging was a way of thinking out loud, making a life long habit of note taking more public. The result was a huge growth in my professional peer network, and I found that learning in this networked manner accelerated enormously. Even if my imagined audience when I write is just 4 or 5 of people, and I started blogging as a personal archive/reflection tool, I kept doing it because of the relationships it helped create. The atmosphere at the unconference was very different. Of the certainties of the years shortly after 2000 nothing much remains. The impulses behind the fascination of yesteryear do remain however. It’s not about, or even less about technology as it was then, it’s about smart actions in themselves, and life under current conditions. It’s about challenging what is presented as unavoidable more than producing unavoidability yourself. Only slowly I understand that technologies are much deeper embedded in social practices and can’t be separated from them. Back then I took over Ton’s concept of ‘people centered navigation’. Through the event last week it became clearer to me what this concept means: not just a ‘right’ efficient way to use tools, but a practice that for specific needs deliberately selects tools and in doing so adapts them. People centered navigation is not a component of better more efficient mass media, but navigating information in reference to needs and capabilities of people in localised networks. Where above all the production of media and content in dialogue with a limited number of others is relevant, not its reception by the masses. Network literacies are capabilities to productively contribute to these localised networks. Just like practice is inseparable from our relationships, our tools are inseparable from our practices. In networked agency, the selection of tools (both technology and methods) is fully determined by the context of the issue at hand and the group of relationships doing it. As I tried to convey in 2010 in my Maker Households keynote at SHiFT and indeed at the earlier mentioned keynote I gave at Heinz’s university on basic literacy in adult learning, networked literacies are tied to your personal networks. And he’s right, the original fascination is as strong as before. Heinz finishes with adding the work of Latour to my reading list, by his last remark. Thank you Heinz for your reflection, I’m glad you participated in this edition. At the Smart Stuff That Matters unconference we did an ‘anecdote circle lite’ as an introductory activity. Participants discussed in small groups about their latest move to a different house, in terms of the biggest disappointment and most pleasant surprise of living in a new house/neigbourhood/city. 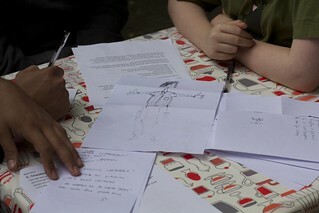 While one participant talked, the others in the group would write down things that stood out for them. This served as raw input for putting together the program of the day. Below the photo of all the remarks that ended up on one of our living room windows, is the transcription of all 130+ post-its. It is unsorted and in random order. Some of the post-its read like they’d deserve their own blogpost to explore. liked a 30s-40s home, but appreciates the comfort of a brand new one. outside city -> center, old house requires a lot of work, what do you really need? connecting to people in building. I try to find words to describe what happened the past few days, but everything I write down feels incomplete and abstract. How do you put into words how much it means to you that friends travel across the world to attend your birthday party? That you can celebrate a new year in life with friends you haven’t been able to meet for four years (or longer)? Who’s lives have changed so drastically in those years, including my own, but still pick up where you left the conversation all those years before? How can I describe how much it means to me to be able to connect all those people Ton and I collected in our lives, bring them together in the same space and for all of them to hit it off? That they all openly exchanged life stories, inspired each other, geeked out together, built robots together? It also extends to the interaction we had with those who could not attend, because the invitation and response also trigger conversations about how other people are doing and what is going on in their lives. I completely share Elmine’s sense of awe. Last Friday we ended the Smart Stuff That Matters unconference by smashing an evil robot called Smarty. Elmine, this being her birthday party, officiated by using ‘The Unmaker’, a hammer my colleague Paul brought us. She proceeded to smash the evil robot that made angry buzzing sounds, as a representation of all the ‘wrong’ types of ‘smart’ automatisation. 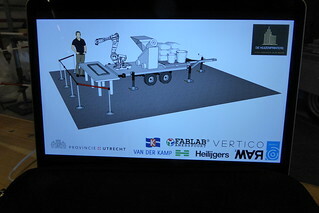 Smarty had been built during the afternoon workshop that Iskander Smit improvised. As I said at the time, part of ‘smart’ is the social side of things, not just the tech side. And part of those social aspects is the frustration and rage that comes with devices and software not responding or working the way we expect them to. 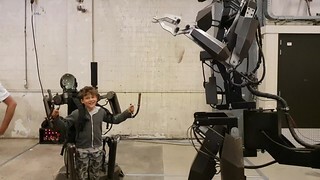 Elmine used the opportunity to take all that out on our evil robot Smarty with gusto. 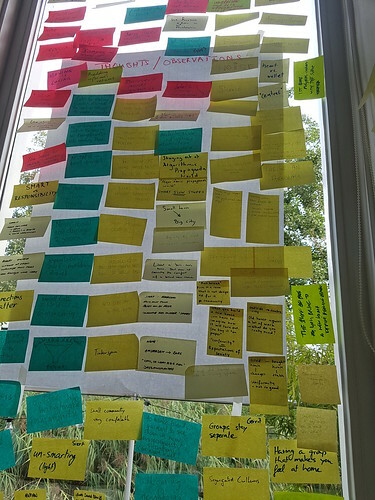 Some people have blogged about their experiences at our birthday unconference “Smart Stuff That Matters” and bbq in honour of Elmine’s birthday. 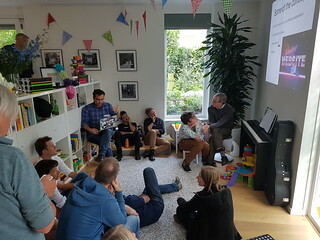 Peter wrote about the session his son organised, and about (re)connecting to the other participants in a way that describes the richness of the interaction well: “All the friends I’ve not yet met“, in reference to a sentence uttered at the event. Frank described his day, and how he came to give a presentation himself in “The unconference is still the best format“. Original is in Dutch, here’s a machine translation to English. Elja wrote a great post about the ‘oh sh*t’ moment where you think no-one will be interested in your story. The original is in Dutch too, so you may want to use the machine translation. 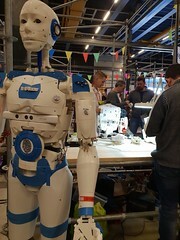 Iskander mentions how he adapted a workshop he regularly organises to facilitate a group to make a robot with the help of the mobile FabLab, Frysklab parked in the courtyard. Heinz wrote a great essay describing and reflecting on the event. There’s a lot to unpack in his posting, which he also ties to the history and character of my connection with Heinz. Elmine, the host and birthday girl herself, is still reeling from all the interaction, and in awe of all the efforts people made to attend. A feeling I completely share. When more postings appear online I will add them here. Our event meant bringing together some 45 people. They all know at least one of us two, but mostly don’t know each other. Some type of introduction is therefore useful, but you don’t want to take much time out of the day itself for it, as often intro-rounds are dreary and meaningless exercises that sap energy and of which you don’t remember much immediately after. So we’ve aimed for our events to have a first activity that is also an intro-round, but serves a bigger purpose for the event. 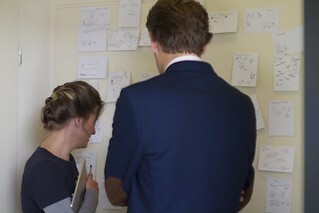 Previously we’ve done 1-on-1 intro conversations that also produced a hand drawn map of connections or of skills and experiences in the group, to be re-used to find the right people for subsequent sessions. We’ve done groups of 5 to 6 to create Personas, as the first step of the design process to make something yourself. This time we settled on an idea of Elmine, to do what can best be described as Anecdote Circles Lite. Anecdote circles are a process to elicit experiences and stories from a group as they reveal implicit knowledge and insights about a certain topic (PDF). You group people together and prompt them with one or more questions that ask about specific occasions that have strong feelings attached to it. Others listen and can write down what stands out for them in the anecdote shared. 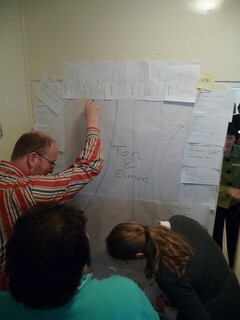 The starting point of the unconference theme ‘Smart Stuff That Matters’ was our move to Amersfoort last year. It means getting to know, find your way in, and relate to a new house, a different neighbourhood, a different city. And do that in the light of what you need to fulfill your needs to be at home and feel supported in the new environment. But in a broader light you can use the same questions to take a fresh look at your own environment, and make it ‘smarter’ in being at home and feeling supported. Our opening exercise was shaped to nudge the participants along the same path. In my opening remarks, after singing a birthday song together for Elmine, I sketched our vision for the event much as in the previous paragraph. 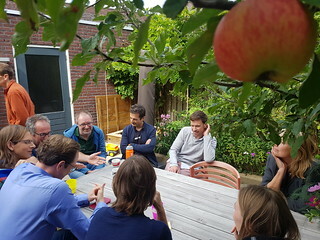 Then I asked all participants to find 3 or 4 others that you preferrably do not know, and find a spot in the house or garden (inviting them to explore the house/garden on their own that way too, giving them permission to do so as it were). 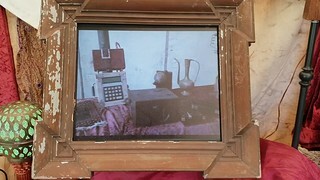 The question to prompt conversation was “Think back to the last time you moved house, and arrived in a new environment. What was most disappointing to you about your new place/live? What was pleasantly surprising to you about your new place/live?” With those questions and pen & paper everybody was off to their first conversations. Judging by Peter’s description of it, it went well. It’s quoted here in full as it describes both the motivation for and the layeredness of the experience quite well. I take Peter’s words as proof the process worked as intended. The second highlight is an event that preceded Oliver’s talk, the “icebreaker” part of the day that led things off. I have always dreaded the “everybody introduce yourself” part of meetings, especially meetings of diverse people whose lives inevitably seem much more interesting than my own; this, thankfully, was dispensed with, and instead we were prompted to gather with people we didn’t yet know and to talk about our best and worst moves in life. What proceeded from this simple prompt was a rich discussion of what it’s like to live as an expat, how difficult it is to make friends as an adult, and the power of neighbourhood connections. Oliver and I were in a group with Heinz and Elja and Martyn, and we talked for almost an hour. I have no idea what any of the others in our group do for a living, but I know that Martyn mowed his lawn this week in preparation for a neighbourhood party, that Heinz lives in an apartment block where it’s hard to get to know his neighbours, and that Elja has lived in Hungary, the USA and Turkey, and has the most popular Dutch blog post on making friends. During the event Elja shared her adagio that the best way to get to know people after moving to a new environment is to do something together (as opposed to just sitting down for coffee and conversation). It’s pleasantly recursive to see a statement like that as the result of a process designed to follow that adagio in the first place. I will transscribe all the post-its and post (some of) it later.